This skillet salmon comes together in 15 minutes and is naturally gluten-free, low-carb and paleo. Top it off with avocado, lime, basil, and salt and enjoy! 1. Heat oil in a large cast-iron skillet over medium high heat. Sprinkle ¾ teaspoon salt, Italian seasonings, crushed red pepper and black pepper all over the salmon. Lay salmon filet skinned side up in the hot oil. Let cook, undisturbed until browned and crispy along the bottom edge, and the flesh is opaque about half way up the side of the filet, 4 to 6 minutes, depending on thickness. Flip salmon over and remove skillet from heat. Allow salmon to remain in hot skillet to allow the carry-over heat to continue cooking the other side to desired doneness, about 4 minutes more. 2. Meanwhile, peel pit and mash avocado with basil, lime juice and the remaining ¾ teaspoon salt. 3. 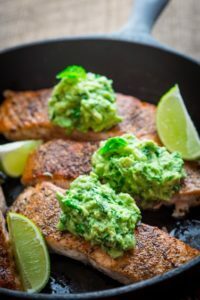 Serve salmon topped with avocado mash sprinkled with scallions if desired.